Reprinted with permission from Voice magazine (Jan/Feb 2010). Recently I was visiting one of my elders’ friends to whom he has been witnessing for about thirty years. In a three hour time period we must have presented the gospel to his friend at least five times, in different ways. His friend just nodded and agreed but never made a decision to trust Christ as Savior. I was along for the ride this time, but this elder in my church faithfully does this every Thursday and has for years. During our ride I got at least three phone calls from people requesting financial assistance from our church. I shared with them the different non-profit groups in our community that can help them. But, and how can I say this tenderly, I had to reject their request. We have several families in our church who have fallen on hard times because the economy in Michigan is terrible and if you lose your job, they are hard to find. Three families in our church were on the verge of losing their homes and so we took a special offering through the month of July to give those families a boost. Our small church gave $2,600 in addition to our normal giving. Our church is involved in organizations like Right to Life and the local pregnancy center. We try to help our friends and neighbors as much as we can. But many people in the American church have started to think that those kind of activities are what make us relevant to the world in which we live. And that is not biblical. 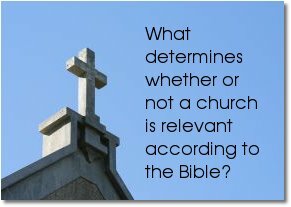 So here is my question: what determines whether or not a church is relevant according to the Bible? The church exists in two forms. The first form is the visible church, comprised of all who make the claim to be followers of Christ. They come together to form the local church, separate local bodies who meet to worship, gain biblical instruction, and participate in the ordinances (the Lord’s Supper and baptism). But not all participants in the local church are necessarily saved. It is a foolish assumption on our part to think every person who attends church on a regular basis knows Jesus Christ as Savior and Lord even if they are active participants. Too often we have heard testimony of individuals who attended church for fifteen or twenty years and then one day they came to be convicted of their need for salvation. The second form of the church is the invisible church comprised of all who are genuinely regenerated, who have been baptized into the body of Christ (1 Corinthians 12:13), and who find fellowship in the name of their Savior the Jesus Christ as true believers. All members of the invisible church are indwelled by the Lord Jesus Christ (John 14:23) through the Holy Spirit (1 Corinthians 6:19). This is the body of Christ given to the world. This ekklesia, or called out gathering of believers, is gifted with spiritual gifts (Romans 12:5-8) for the building up of and strengthening of the church (Ephesians 4:12-13). It was founded by Jesus Christ and is under His rule (Colossians 1:18). So the local church is a body of Holy Spirit filled individuals gathered together to carry forth the purposes of Jesus Christ in this world. Jesus Christ called the disciples together and gave them a very explicit job description (Matthew 28:18-20): reach the lost, strengthen the believers. Go out and create other followers of Jesus Christ in every nation, having them unashamedly declare their dedication to Christ through baptism. Then teach them to live in obedience to His Word in its entirety, all for the glory of Jesus Christ. Paul gave a similar command, basically saying to the church at Ephesus, “you have been given gifts in the church to expand the church by strengthening believers” (Ephesians 4:11-16). We are to edify, build up the body of Christ as each member does our part. The end result should be that the church reaches the lost. Are we to make big churches? I am not an advocate of the mega church movement and in many cases I see some problems. But big churches can be good. When a church is doing what God has called it to do and is using its gifts effectively, the church should see some kind of growth. It is not good to say, “we preach the Word but our church is just not growing.” God said we have been equipped to build up the church. Now maybe your membership will not grow, but if we are using our gifts effectively people should be getting saved. We are to reach the lost. We are secondly to strengthen believers. Through the gifting of the Lord, we are to prepare our people to do ministry. If we are doing what Paul instructs us in Ephesians 4:11-16 our people will become more effective ministers themselves. They will be using their gifts to reach others and they will not be distracted doing things that do not pertain to the church’s purpose. It is a great work of Satan to have churches so busy doing all kinds of “relevant” work in a community (and of course being praised for it) that we do not do what God has called us to do. And that in the end is always to reach the lost and strengthen the believers. Paul told young Timothy not to get distracted (1 Timothy 6:20-21). “Timothy you have two purposes, protect the gospel and strengthen the believers.” We are the guardians of the most important message the world has ever received and it is important that we do not allow it to be distorted. The church is the instrument God has determined to share the power of Christ to a lost and dying world. We are to make sure our people understand the truth of the gospel so they will be able to stand in times of persecution, doubt, trouble. Is the church relevant to the world today? I would answer that by asking if there is still sin in the world? Yes. Is sin still destroying lives? Yes. Is there an answer for dealing with sin aside from the gospel? No. If the gospel is the only answer for corruption in this world, then the church is still relevant as long as it is preaching the gospel (Acts 4:12). If believers must be strengthened to go out and share this life changing message, then as long as a church is training believers to reach the lost it is still relevant. If the church is not preaching the gospel, if the church is not strengthening believers with the knowledge to combat the enemy and preparing them for the work of the ministry (preaching the gospel), then it is not relevant. So reader, is your church relevant? If it is not relevant then here are some commitments that will put you on the road to relevancy. Every effort must be made to share the gospel from your pulpit. Every effort must be made to encourage and expect a life of obedience to God’s Word from your church members. Every effort must be made to prepare your people to share Christ with others. Every effort must be made to keep you from distractions and the expectations of a lost world that wants everything the church has to offer, except Jesus Christ. We will sing…to share Christ and strengthen believers. We will have banquets…to share Christ and strengthen believers. We will preach…to share Christ and strengthen believers. We will play softball…to share Christ and strengthen believers. Don’t seek to be relevant according to this world. Be relevant according to God’s plan and purpose (Ephesians 4:17-18). Chad Nightingale is a graduate of Word of Life Bible Institute (Schroon Lake, NY), Lancaster Bible College (Lancaster, PA), and Grand Rapids Theological Seminary (Grand Rapids, MI). He is a staff member of Encounter Revival Ministries (Harrisburg, PA) and pastors Allegan Bible Church (Allegan, MI).